The ghost town of Bodie, a little ways northeast of Mono Lake in California, must be one of the largest, well preserved ghost towns around. The state park service has been carefully keeping Bodie in a state of "arrested decay" (their words), with some patching up of buildings having been done in such a way as to look as original as possible, using aged lumber etc., at least that is what I was told during my last visit back in 2003. I must say, I did notice during this time that some of the newer repairs do not look that authentic, with much fresher looking boards being used etc. Nonetheless, generally speaking, the town is pretty amazing and well worth exploring! 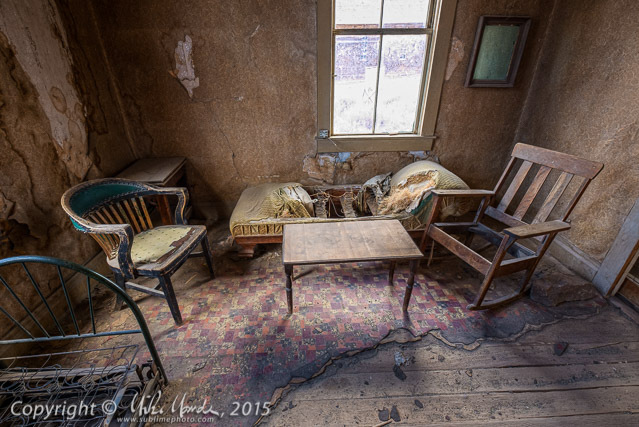 I spent many hours wandering through Bodie and took many shots of interiors, mostly from the outside, looking in through dusty, hazy, blotchy windows. 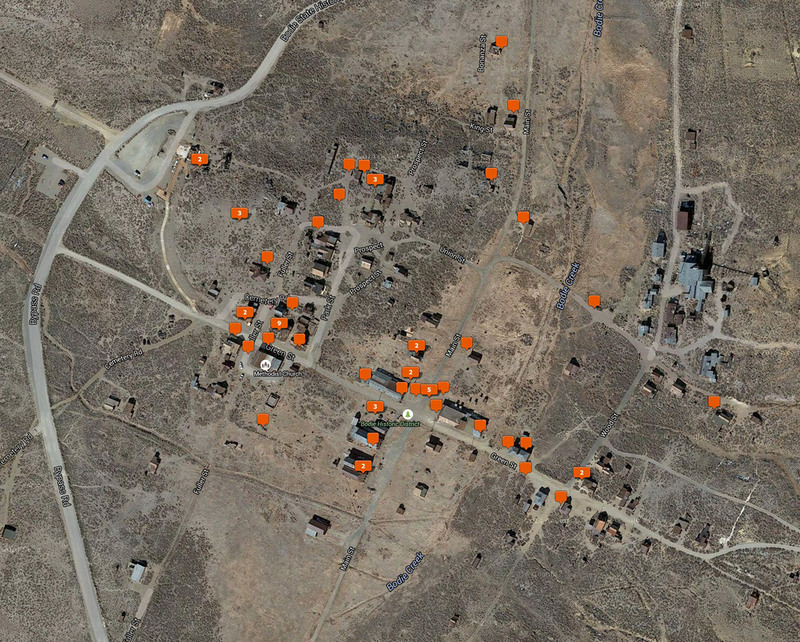 Above is a screenshot from Lightroom's map view, showing the location of the 64 photos in my gallery that were taken in Bodie. The large mill complex you see near the right edge is fenced in and off limits to the public due to dangerous conditions, although I believe one can arrange to go on a tour. The black-flies were nasty when I was there and managed to make it through my vented Outback hat. At the end of the day, I had dozens of itchy bites on my scalp! However I was fully in "photo mode" and because I was concentrating on shooting, I somehow managed to mostly ignore that irritation. Many interior photos that I had taken through glass were lacking in contrast and saturation, due to the hazy dust coating the windows. Lightroom and PhotoNinja allowed me to make quick work of restoring the shots to a proper level of contrast, despite the fact that I am not using the latest version with the "De-Haze" filter. In a few cases, I selectively adjusted bright, out of focus blobs that came from particularly large white specks on the windows that were reflecting outside sunlight. Generally I held my camera with my right hand, and used my left hand, sometimes holding my hat, to try and minimize window reflections from ruining the shot. I also often removed the lens hoods from my lenses and went as close as possible to the window panes to try and minimize outside reflections as well. I wore a black jacket too so it wouldn't add to the reflections. All in all, I am actually very pleased at how many of those difficult shots turned out quite well! During my last visit to Bodie in 2003, I was shooting film with a Pentax 67II and a Fujifilm 6x17 panoramic camera. None of the interior shots I tried doing with that Pentax, from the outside looking in, worked out at all. I was likely shooting either Fuji Velvia (ISO 50) or Provia (ISO 100) at the time and needed to use a tripod for any shots with slower shutter speeds. With the tripod I had back then, I couldn't get the camera close enough to any windows to avoid reflections, and there is no way that I would have had any chance at all of handholding the 67II and getting sharp interior photos either, with those slow film speeds and a lot of shutter and mirror vibration. Plus, the minimal dynamic range of slide film would not have allowed me, in many cases, to capture the brightness range needed in a single frame, where window light was the sole illumination for deep interiors. Shooting with a lightweight digital camera (my Fujifilm X-E2) which has minimal vibration, very good dynamic range and quite clean high ISOs, as well as using lenses that are sharp at wider f-stops, allowed me to get shots I never could have back in my film days! However, luckily some shots this time were actually taken from the inside (no glass in the way) and those were much easier to do, for example, like the image at the top of the this post. The description at the start of the gallery specifies which shots were taken from inside a few of the buildings or where there was no glass. Enjoy!